Before I tell you about that tasty salad you see there, I just want to explain one quick thing... I was looking back on my last few recipe postings and I realize that they are all quite healthy. I can promise you that all of my recipes won't be healthy! I let loose on weekends for sure. This past weekend, I downed a large piece of key lime pie like nobody's business! But during the week, I get serious, which is where this salad comes in. I was cleaning out my pantry over the weekend and I found a bag of bulgar wheat way in the back. I remember seeing Ina Garten make tabbouleh on one of her shows a while back and I have wanted to make it since then, but never got around to it. 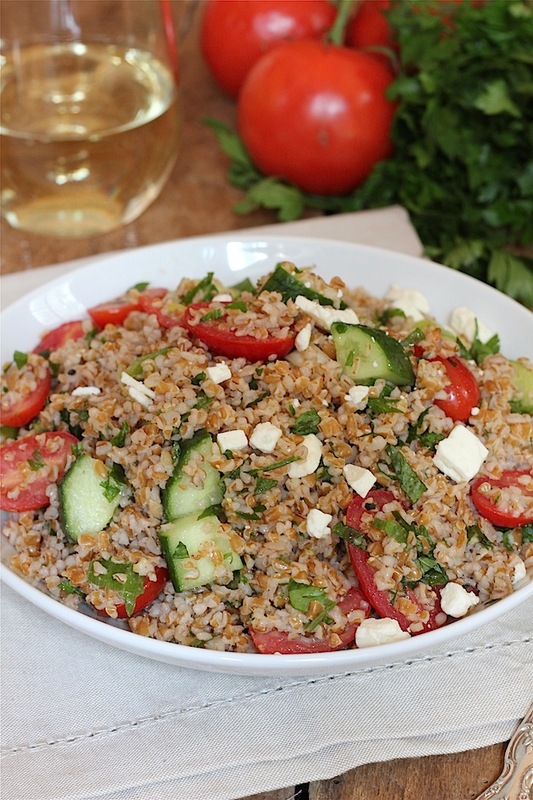 The bulgar wheat way back in the pantry reminded me of that and it was perfect timing. I made this on Sunday night for week. It not only tastes both refreshing and good, but is the perfect side for a cookout, easy to make and it only gets better as it sits! 1// Place the bulgar wheat, cold water and 1/2 teaspoon salt in a medium sauce pan. Cover and bring to a boil. Once it comes to a boil, reduce the heat to simmer. Simmer for about 12 minutes or until all of the water has dissolved. Once it is cooked, fluff it with a fork and put it in a large bowl to cool. 2// While the bulgar wheat is cooking, whisk the lemon juice, olive oil and 1/2 teaspoon salt and pepper in a small bowl. Pour the dressing over the warm bulgar wheat. Fluff again with the fork and set aside. 3// Chop the vegetables and add to the cooled bulgar wheat. Add the feta cheese and gently toss the salad. Taste for seasonings and add more salt or pepper if desired. Looks delicious. My neighbor used to make this all the time in the summer. I recently discovered a container of quinoa that I purchased when inspired by Food Network a while ago, so I've been putting that stuff in everything since. Haha. Look like a delicious dish, and super fresh! I've never made this myself, but now's my opportunity to try! That is such a great go-to salad. I went through a phase of making that salad at least one a week. It would last a couple of days as I always make tons! Love the lemony flavor it carries. 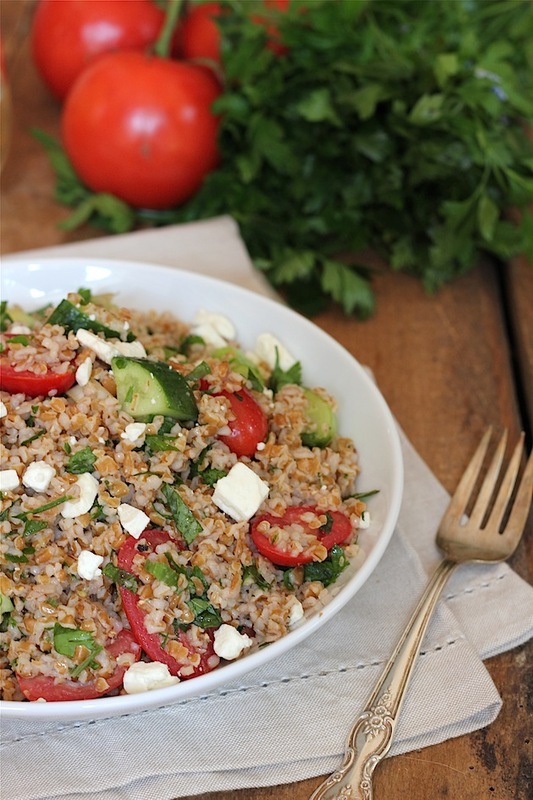 I love tabbouleh and this looks delicious! How perfect is this yumminess. I adore tabbouleh.